Few historical trials speak to the imagination as much as the Salem witch trials of 1692, an event that led to the executions of twenty innocent people through an unfortunate combination of mass hysteria and theocratic despotism. Seeing parallels with the manic hunt for communists in the McCarthy era, Miller published his play The Crucible in 1953, three years before he himself was summoned to appear before McCarthy’s committee. More than sixty years later, the play remains a compelling indictment of mass hysteria and juridical fumbling – has society not changed much at all? This week, St Hilda’s College Drama Society stages Miller’s most widely performed play with an impressively large cast: twenty-one people share the stage. Two roles that weren’t in Miller’s original have been added, Martha Corey and Ruth Putnam, who are only spoken of in Miller’s play. The play focuses on John and Elizabeth Proctor, husband and wife played by David Meijers and Alice Gray. 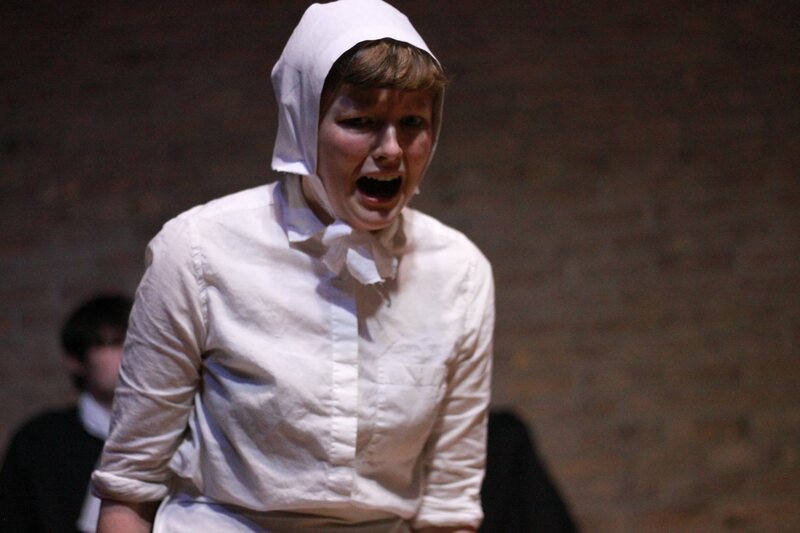 Elizabeth is falsely accused of witchcraft by her former maid, Abigail Williams, played by Mary Higgins. This trio, Gray, Meijers, and Higgins, deliver the play with astonishing conviction, ensuring a lasting impact on the audience. The play opens impressively, the music overwhelming, matching the bewildering effect of the action on and around the stage. Throughout the play, good use is made of the various resources available in the theatrical space, with sounds, voices and singing at times coming from outside, increasing a feeling of immersion for the audience. The scene cuts, on the other hand, are extremely sharp, suddenly plunging the audience into darkness, conveying a feeling of increasing paranoia and mass hysteria extremely effectively. Through both the lead actors’ excellent performances and these clever technical enhancements, the play builds tension immensely well. In the first scene, as Betty Parris (Bee Liese) is apparently possessed by the devil, Liese plays her part of possessed child so convincingly, and is handled so seemingly roughly by the others, that one may wonder if she comes home with bruises from each performance. Well-acted violence is part and parcel of this play: David Meijers as John Proctor is at his best during emotional extremes. At the moment when John Proctor has to say his ten commandments to prove his Christianity and innocence, he manages to make this simple summing up a nail-biting moment. Not all performances are equally convincing, however: the age difference between the characters is not always clear, especially with the elderly characters seeming younger than their lines suggest them to be. It is of course at the trial of Elizabeth that emotions come to an extreme, and both Meijers and Gray shine in these scenes. Unfortunately, the emotions of Deputy Governor Danforth (James Galvin) also boil over at this point, and here Galvin shows himself to be a better actor when he is calmer, contrary to Meijer. Galvin can put on a seriously impressive bellowing voice, which is startling the first time, makes half the crowd jump the second and third time, and begins to feel slightly exhausting every time it is used after that. The ending is as overwhelming as the start of the play, as those who know it – or the Salem trials – may well expect. Here, the lead actors show how emotionally invested they were in their acting, Alice Gray wiping away her final tears during the curtain call. 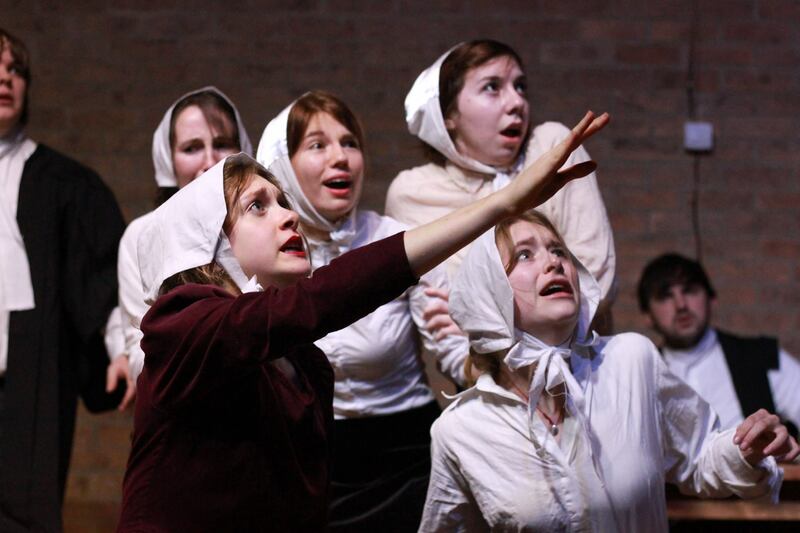 The Crucible, which runs at St Hilda’s until Saturday, is well worth your time. For more information about ‘The Crucible’, please visit the event’s Facebook page.